The race is given, not to the swift, but to the stubborn and steady. Adolfo Pérez Sampayo, 58, the owner of Meson Sevilla in Hell’s Kitchen, knows that. Until he got sidelined two years ago due to a bad knee, he had completed 39 marathons—despite being told by his doctor that he could not run marathons. “I love discipline. Discipline, but with liberty,” he said, recalling the shadow that dictator Francisco Franco cast over his native Spain. Pérez comes from the village of La Cañiza, in Galicia, the verdant, northwesternmost province of Spain and one of the seven Celtic nations. Many emigrants have left its shores to seek better fortunes elsewhere, as did he when he was 19. 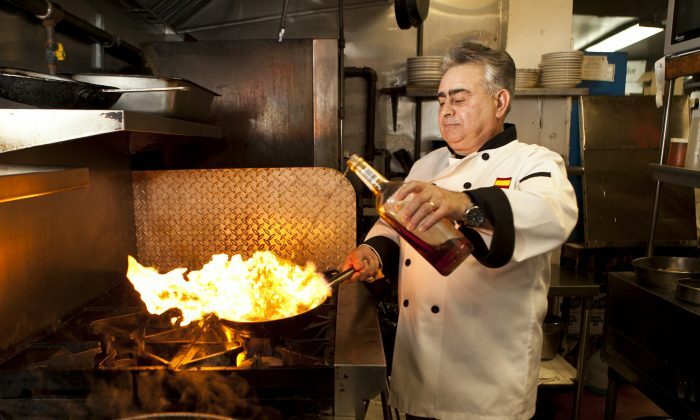 Pérez’s discipline and hard work, coupled with a love for food and the restaurant business, has seen him championing Spanish food in New York City for more than 30 years. At age 7, Pérez already had some experience cooking. Like everyone else, he says, the tortilla española, or Spanish omelet, was the first dish he cooked. He was also charged with overseeing his mother’s cocido, a sort of stew with different kinds of meat, cooked for many hours. It’s hard to mention this dish without eliciting oodles of nostalgia from gallegos, as those from Galicia are called, or reminiscences about the seafood. The best octopus, or pulpo, is reputed to come from the cold Atlantic waters off Portugal and Spain. At Meson Sevilla, it’s buttery soft. It comes down to “quality, quality, quality,” said Pérez. A friend of his had asked him to come down to his kitchen to look at some octopus he’d gotten. “We went into the kitchen, we cut it. I said, ‘First of all, I don’t use this pulpo. '” His friend deplored how much more expensive the higher quality kind was, but low-quality octopus is “like chewing gum, no matter how you cook it,” Pérez said. He admits his own taste runs toward a less soft texture, and more what you’d find in the pulperias of Spain, harder than his customers’ liking. Pérez opened his first restaurant, El Escorial in 1982, followed by Picasso (it is no longer around—its success inviting a dramatic rise in rent). Pérez championed tapas, which were relatively unknown back then. The Food Network featured the then-novelties apparently because drinks were covered with a small plate as a lid, and the bartender would put a small bite on top. Today, Meson Sevilla’s list of tapas is one of the most extensive in the city. But the road to introducing authentic Spanish fare and customs wasn’t always easy. When he had his restaurant Picasso, his son Adolfo Pérez Alvarez said no one else had the cured serrano ham and cheeses on display as is the tradition in Spain. “[My father] would get fined every time Board of Health inspectors came in. Every time. He just paid the fine, paid the fine” for three years, until inspectors relented. To this day, the elder Pérez isn’t sure why he stopped being fined, and he didn’t want to ask why; the timing coincided with Spanish ham finally being permitted into the United States. Up until then he had been using the American-made but excellent Despaña brand by Marcos Intriago, a friend of his. About 3,300 miles from his native home, over the Atlantic Ocean, Pérez never went against tradition with the ham, the taste of which his son said would have been compromised by refrigeration. Nor of the cheeses, which needed time to sit outside to come to ambient temperature before serving. La Cañiza’s native son must have done its villagers proud. But they couldn’t expect anything less from such an uncompromising man.